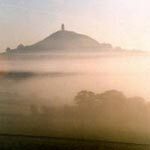 Merlin's archetypal forces are still roaming this world, even though some say he would be staying at his glass castle underneath the 'Tor' in Glastonbury/Somerset (see picture). See a summary at GeZi's BLOG. Is he the true Avatar? You answer this for yourself,hehe.. I for myself.. ..I'm not necessarily claiming to reincarnate King Arthur even though the comparison is quite flattering, I have to say..
24 Apr 2004 @ 19:51 by nemue : ??? As the reincarnate of the Lady of the Lake I don't remember you dear soul..enough said...as a Bard you may like to visit here..
28 Apr 2004 @ 01:31 by Ge Zi @24.126.196.158 : memorial plaque? ?